♥ Great Value for Money. Most skincare products contain 70-80% water which simply vanishes from your skin. When using Laila products, you can use 70-80% less, so a little goes a long way. From Laila London Relief Repair Replenish Range suitable for dry, itchy skin and skin prone to eczema, dermatitis and psoriasis. ♥ It contains Calendula – a natural, powerful anti-inflammatory that promotes healing and cell regeneration but does not have the side-effects associated with prescribed topical steroids. Essential oils heal, soothe, reduce itching and balance the production of sebum, improving both dry and oily skin. ♥ Most moisturizing products contain 70-80% water which simply evaporates from your skin. When using Laila products, you can use 70-80% less, so a jar lasts an incredibly long time – Size 2oz will last a long time and offer great value for money. ♥ Made with fair trade ingredients. 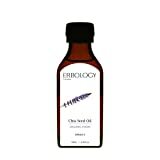 Erbology chia seed oil is loaded with healthy fats, vitamins and antioxidants. In one spoon, you’ll get over 60% of omega-3 essential fatty acids. OMEGA-3 has been extensively studied for its support of heart activity, nervous system and eye health. It helps nourish hair follicle and scalp, leaving your hair look stronger and shinier. Enjoy a spoonful of our cold-pressed chia seed oil in your favourite cold foods, salad, pasta, soup or apply a small amount to skin and hair. TIP: Make a simple hair mask for dry or frizzy hair with just three ingredients. Mash up 1/2 ripe banana, 1/2 ripe avocado and add 1 tsp chia seed oil. Mix well and massage into your hair. Leave on for about 20 minutes. Then rinse and wash your hair. Discover Erbology range of oils from SEA BUCKTHORN, AMARANTH, HEMP and more. NOTE: Not suitable for pan cooking. Please note our chia oil has a distinctive taste and fragrance similar to fish oil. This is a result of high content of omega-3 fatty acids present in the oil. Organic Turmeric Extract 10,000mg + Bioperine® – 120 High-Curcumin Tablets. A very powerful natural antioxidant, formulated for optimum absorption. GUARANTEED STANDARDISED EXTRACT at 95% Curcumins – these are the active compounds in turmeric. ADDED BIOPERINE (black pepper extract) for added bio0availability and absorption of Curcumin – The body does not easily absorb Curcumin without the help of a bioactive ingredient. BioPerine adds up to 2000% more absorption. FAST & FREE UK P&P and 100% Money Back Guarantee – Don’t delay, order today! A popular partner to Glucosamine, our Turmeric supplement uses an extremely high potency organic extract providing Curcumin levels equivalent to 10,000mg of regular Turmeric powder – this is not to be confused with the powder that you use in your kitchen, as our Turmeric extract is standardised to provide 95% Curcumin, a massive 475mg in each and every tablet. BioPerine® is an extract obtained from the black pepper fruit that is cultivated in the damp, nutrient-rich soil regions of southern India. The delicate pepper berries are harvested just prior to ripening and then sun dried to assure optimum maturity and quality. The extract of piperine, called BioPerine® in the patented form, has been clinically tested in the United States. BioPerine® significantly enhances the bioavailability of various supplement nutrients through increased absorption.